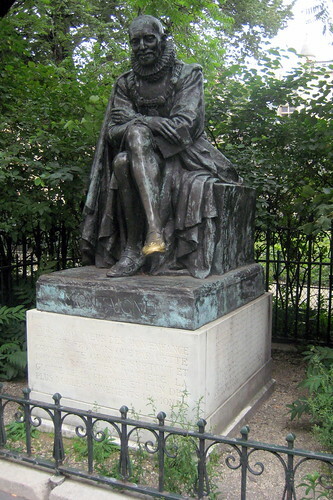 The statue of Michel de Montaigne by Paul Landowski (1896-1961), which stands in Square Paul Painlevé across the street from the main entrance to the Sorbonne on Rue des Écoles, was executed in 1933. Students at the Sorbonne believe it is good luck to touch Montaigne's shoe before an exam, lending the statue's foot its bright polish. Michel Eyquem de Montaigne (1533-1592) was one of the most influential writers of the French Renaissance. Best known for popularizing the essay as a literary genre, his massive volume Essais (Attempts) contains, to this day, some of the most widely influential essays ever written. A conservative and earnest Catholic, Montaigne also possessed an anti-dogmatic cast of mind and is considered the father, alongside his contemporary and intimate friend Étienne de La Boétie, of the 'anti-conformist' tradition in French literature. In his own time, Montaigne was admired more as a statesman than as an author.